Kleros uses blockchain and crowdsourced specialists to adjudicate disputes in a fast, secure and affordable way. Kleros connects users who need to solve disputes with jurors who have the right skills to solve them. Crowdsourcing taps into a global pool of jurors. Blockchain technology guarantees evidence integrity, transparency in jury selection and incentives for honest rulings. What problem does Kleros solve? The rise of disputes of the global, digital and decentralized economy in areas that cannot be solved by state courts and existing alternative dispute resolution methods. For example, in international e-commerce and service delivery. Kleros uses blockchain and crowdsourced specialists to adjudicate disputes in a fast, secure and affordable way. 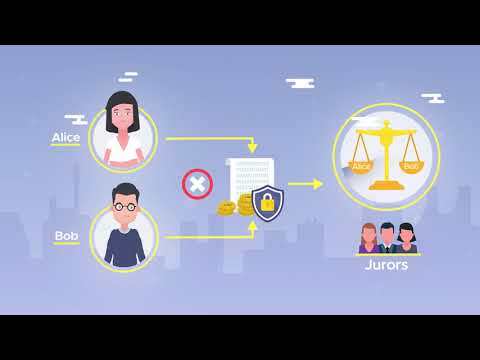 Kleros connects users who need to solve disputes with jurors who have the right skills to solve them. Crowdsourcing taps into a global pool of jurors. Blockchain technology guarantees evidence integrity, transparency in jury selection and incentives for honest rulings. Alice hires Bob for a freelancing work and they both select Kleros as arbitration provider. Instead of paying Bob directly, Alice sends the payment to a smart contract. A dispute arises. Evidence is sent to Kleros, which draws a jury of experts. Jurors analyze the evidence and vote Alice as winner. The smart contract reimburses Alice. Jurors collect arbitration fees for their work, which are paid by Bob. The case is closed. Vladimir. I'm not sure where you got your information but it seems you haven't researched the project at all. There is no soft or hard cap as we are using an Interactive Coin Offering as proposed by Vitalik himself. This negates the use for either Soft or Hard cap as each contributor can set their own. What does localized team and advisors even mean? We are situated around the globe. What extra information do you need to see? Our team are all verifiable on LinkedIn as well as pitchin at Consensus2018, Token 2049, ETHCC, Devcon and incubated by Thomson Reuters a huge name. I suggest you do some better research in future before reviewing further projects. It's clear you haven't taken any time to do this at all. 20% decreasing to 0% at the end of the two month duration.